Merry Christmas Eve! 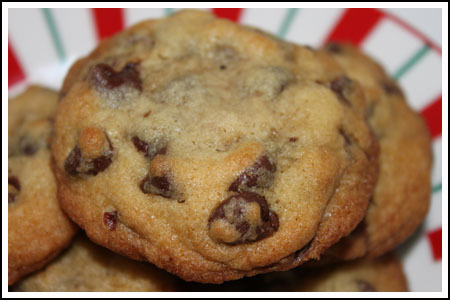 I’m making a couple of new holiday desserts and will report back soon, but until then here’s a terrific chocolate chip cookie recipe (some call it The Ultimate Chocolate Chip Cookie) I discovered while reading my friend’s blog, Cooking for Engineers. This isn’t actually Michael’s recipe, but a fellow named Mark linked to it from the comment section saying it was from a well-known Unix guru who was a wiz with chocolate. My eyes got blurry scanning the 150 comments, but I think it’s the 15th comment down. Luckily the Ultimate Chocolate Chip Cookie lives forever in cyberspace, and I hope you agree that it should stay there. It makes an excellent thick, chewy, crispy-edged cookie and doesn’t require fancy flours or specialty ingredients. Technique is the key. There’s a lengthy creaming of butter & sugar (hence, the stand mixer) and the eggs are mixed with vanilla and added in an ever-so-slowly fashion spanning 3-4 minutes. Finally, Richards recommends chilling the dough overnight and stresses that without that chill-time, the cookies will be just regular chocolate chip cookies. Hmmm, not so sure. I cheated with the chill time and mine were fabulous, but I used cold butter and that probably gave the chill time a head start. At any rate, I can’t wait to bake up a few more tomorrow. I’ve linked to the original recipe and recommend you follow it, but in case it goes away or you need to know how much the flour weighed, here’s my adaptation. I increased the salt by a pinch. Sift together the flour, baking soda and salt; set side. Beat cold butter until creamy in bowl of a stand mixer fitted with the paddle attachment. Add both sugars and continue beating at medium speed for about 3 or 4 minutes, stopping to scrape down bowl occasionally. Meanwhile, mix the eggs and vanilla together in a separate (small) bowl or measuring cup and slowly, one tablespoon at a time, add the egg mixture to the cream mixture while the mixer is in motion. This should take another 4 minutes. With mixer on lowest speed or by hand, add dry ingredients. When incorporated, add chocolate chips and nuts and stir to mix. Shape dough into golf ball size balls and arrange on a cookie sheet right next to each other. At this point, you are chilling them not baking them so you don’t have to worry about spacing. Cover dough balls overnight or for 6 hours. Remove and let warm to room temperature (30 minutes). Arrange cookie balls on ungreased cookie sheets spacing about 3 inches apart. Flatten a little to resemble a hockey puck, about ¾-inch high. Make edges go straight up and down. Make a slight depression in center with finger. Bake at 400 degrees, 8-10 minutes (mine took a little longer). Edges should be golden brown but center 1-inch pale. Let sit at room temperature 5 minutes before taking off baking pan. Makes about 32 cookies if you use all the chips and nuts, but if you use only 2 cups of chips and leave out the nuts you'll get somewhere around 28 cookies. If you have a scale, it's best to weigh out 11.25 oz flour. If you don't have a scale, give the flour a good stir before measuring it and make sure not to pack it into the cup. Thank you! By the way, your site is awesome. Samantha, bleached should be fine. The cookies might even be a little puffier or cakier, but not overly so. Good luck! I was wondering, in your version, it says to use unbleached flour; but if I used bleached flour, would it make a noticeable difference? Melissa, I use the paddle on the stand mixer to beat the butter until creamy. In this case I don’t think cold vs cool matters since the dough gets chilled anyway. The butter should not be warm, though. I think ideal butter temp is 65f. I have another quick question — In your recipe you say to use cold butter, but in the original recipe it says “room temperature” — does it make a difference? My cookies tend to firm up but they never really get hard. If I want harder or crisper cookies, I usually use a different recipe. I have a question — do the cookies stay chewy over a couple of days? Or does the crust get harder over time? Just curious — D prefers chewy cookies. I like mine with a bit of crunch. This one sounds like it has the best of both worlds! 2 sticks of butter is equal to 8 oz. Each stick = 1/2 cup or 4 oz. It’s probably different in other countries, though. It’s more accurate to say 8 oz. did I miss something…the original has 2 sticks of butter, but yours has only 8 oz. It’s still great, but just something I noticed. I made these cookies a few days ago and they were just amazing! They were so chewy and soft – and the cookie dough was delicious, too! This is such a great recipe and I will definetely make them again! Thank you! Lisa, I’m glad they turned out :). The cookies turned out! They don’t look exactly like your picture but they are delicious none the less. I also think that they tasted even better the next day! I froze mine so I would stop eating them but my husband found them so there is no hope for them now!! I use my hand held mixer for most recipes, but for this one I pulled out the stand mixer and let it run for the full time. I was also careful to add the egg little by little. The result was a great cookie of medium thickness. It sounds like you got off to a bad start by using the hand mixer. It might not have had quite enough power to do the job efficiently, but maybe the cookies will be better than you think. Let us know! I just tried making these cookies tonight using a hand mixer and I don’t think they turned out as they are suppose to! My arm became very sore from standing over the bowl and mixing so much. Now I understand why everyone loves their stand mixers! And it was difficult to mix the cold butter especially since I didn’t have the paddle attachment. I guess I’ll find out tomorrow once I bake them if they turn out. Thanks for the reviews, Louise. I agree with everything above. About the 400 degree temp, I was reluctant to use that as first, but I did and things worked out fine. The cookies are not uniformly brown when you take them out of the oven, but they go from being pale in the center to brown on the edges and golden in the center fairly soon after you take them out. So in my case the centers didn’t look quite done at 9 minutes, but were perfect after they’d cooled (or baked internally while sitting on the counter). At 10 and 11 minutes, the cookies were still good, but had a slightly well-done flavor. I’d only advise reducing oven heat if your oven runs hot. My cookies came out of the oven about two hours ago and I just had one with my coffee. These are GREAT cookies. The original recipe doesn’t call for “toasted” walnuts, but I, like Anna, toasted them before starting. After chilling overnight in the garage there was no way to make a depression in the center before baking, but it didn’t seem to matter. After the first sheet baked at 400 I tried a sheet at 350, the temperature many cc cookies bake at. They got more uniformly brown, but it didn’t seem to really change the cookies. I reverted back to 400. I use a convection oven so the true temperature is 375, but the cookies baked in 8 minutes. I think these are better than the CI cookies as these don’t seem greasy like the CI ones. I’m a fan of the Alton Brown “The Chewy”, so I’ll have to make some side by side to compare. Shannon, I think you could use a hand-held electric mixer, but you’d have to be patient and stand there for 4 minutes while you cream the butter and sugar, then stand there for another 4 minute while you slowly add the egg. But I don’t see why it wouldn’t work. But mixing by hand wouldn’t give you the same result. About the overnight chill, these cookies are fine the first day without a chill, but they really are better if you bake the dough the second day. The best way I can describe it is that there’s more contrast between the “shell” of the cookie and the inside. The inside seems lighter and the shell seems crispier and sturdier. Do you like these better than the Cook’s Illustrated cookies? What do you think about leaving out the nuts? 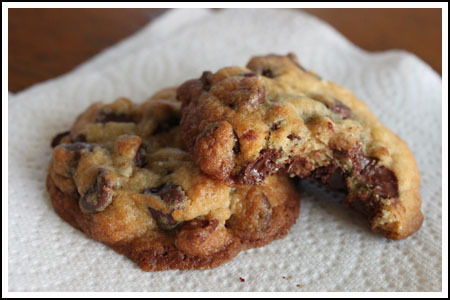 Shannon – The original recipe says that if you don’t use a heavy duty mixer (to cream the butter, sugar, and eggs, as directed) and don’t let the cookie dough rest in the refrigerator overnight, these are just regular chocolate chip cookies. Do you think these would turn out the same if made with a hand-mixer? Thanks for another year of wonderfulness. I’m sure Fuzz will enjoy leaving these for Santa. As for me? I’ve bookmarked these to make (maybe tomorrow). I like that website. Their banana bread is my favorite. My kind of cookie, must add this to my list! What a wonderful Christmas present of a recipe–easy, yummy, and traditional! I hope your household has a merry Christmas filled with joy, and I’m sure Fuzz is confident that Santa is leaving extra-special gifts because of the extra-special cookies he will find!